Ocean and sea forts are few and far between and with good reason: only in fairly extreme circumstances is their expense deemed justifiable. Since being decommissioned, many of these have gained strange second lives as everything from luxury resorts and private retreats to micronations and pirate radio stations. It sounds extreme, but be honest: wouldn’t you want a sea fort of your very own? 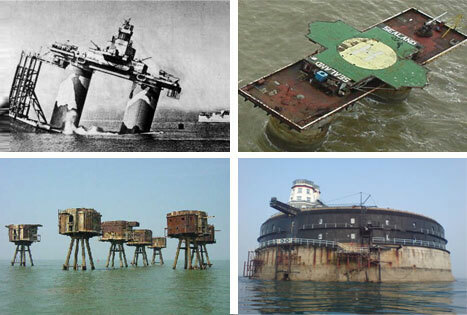 Guy Maunsell is responsible for an amazing series of WWII army and navy sea forts, many of which still stand today. 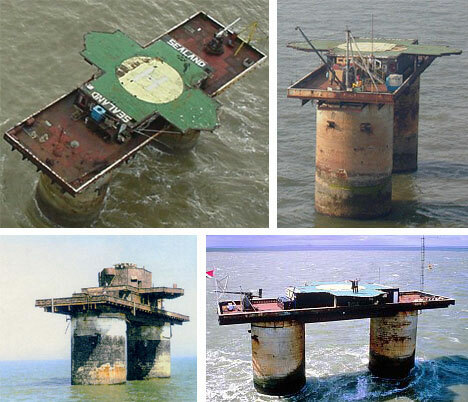 One of the most infamous of his navy sea forts has since been converted into a micronation named Sealand. 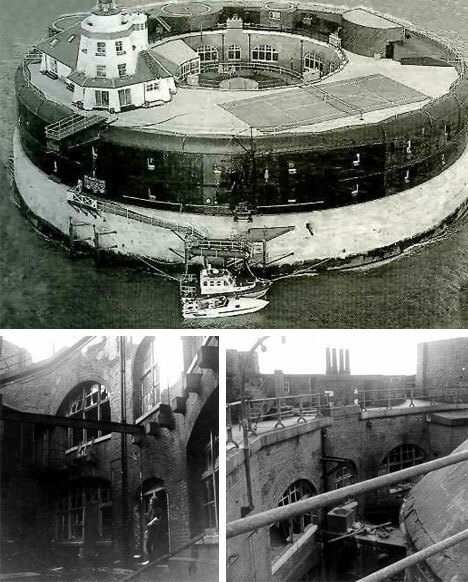 Four navy forts (shown above) were pre-constructed and then arrayed off the coast of Britain to expand radar coverage and provide anti-aircraft fire with huge mounted guns. So how did they put them in place? The base pillars were carried out by barge and then the whole structure is sunk and filled with water. 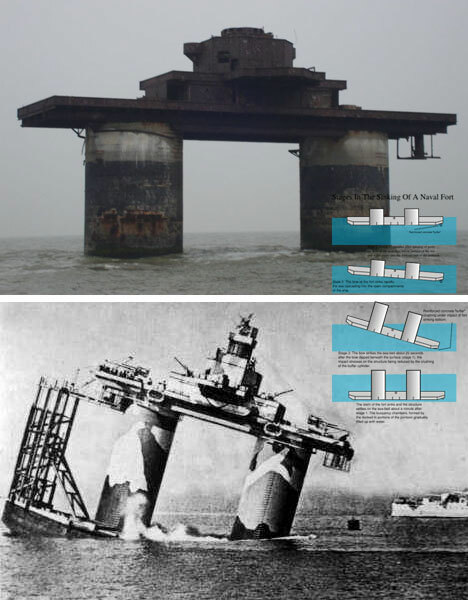 Maunsell’s army sea forts were more specifically designed to repel smaller aircraft flying in to attack rather than to lay mines at site. Each fort consists of a cluster of smaller units arrayed in a group. Each group had one spotlight tower and the rest of the units had guns mounted all around to give maximum range. Each fort was connected by bridges to the others in the cluster but was also structurally autonomous – presumably in case one were to be successfully targeted and destroyed. 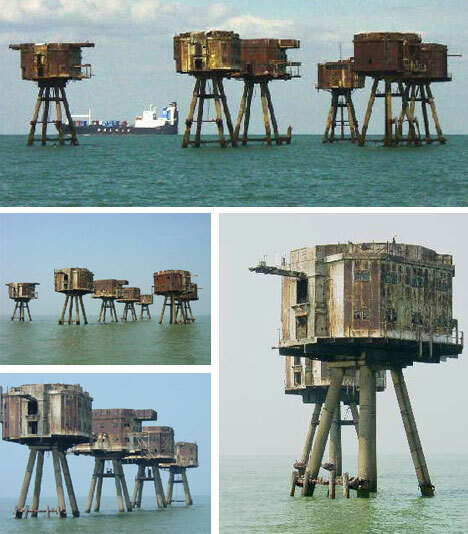 Since being decommissioned, a number of these forts have been used for pirate radio broadcasting stations. Horse Sands, Spitbank, St. Helens and No Man’s Land Forts were created in the mid-1800s as defensive sea forts around Portsmouth. 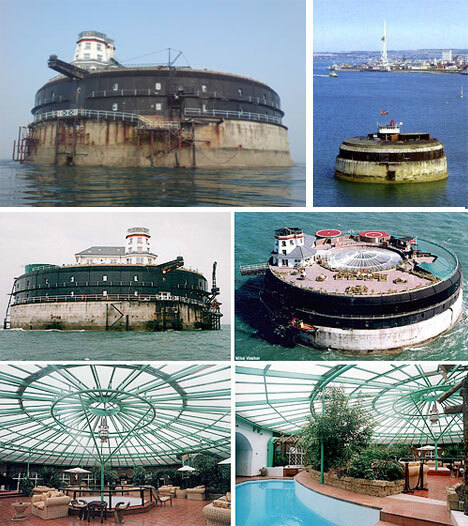 Some are now abandoned or under private ownership but No Man’s Land Fort has actually been converted into a luxury resort and Spitbank has been transformed into a museum, hotel and events space. St. Helen’s fort can actually be reached on foot during low tides at certain times of year. At one point, a failed businessman barricaded himself in No Man’s Land Fort to escape his creditors. The Nab Tower, now a lighthouse, was created in 1918 near Southampton in order to protect merchant vessels from attacks by German submarines. At 40 feet wide, 90 feet tall and a cost of over a million dollars a piece eight such towers were to be created and linked with steel nets to keep out U-boats. In the end, only this tower was constructed and installed – one other was scrapped after being partly built. 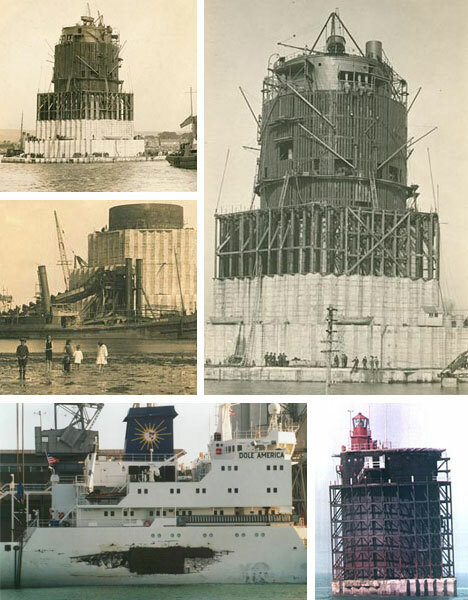 The tower was built on a concrete based towed out to sea then filled with water so it would sink to the bottom. However, in the sinking process the structure tilted slightly and remains at a 3 degree angle. In 1999, the commercial (Dole) ship shown above collided with the tower causing damage to both ship and structure.